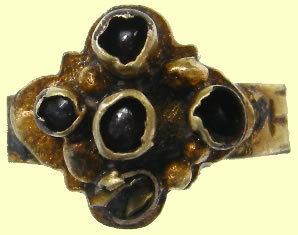 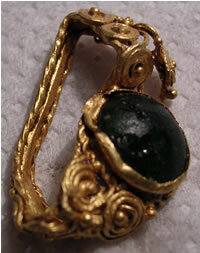 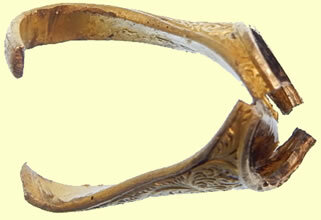 Complete but damaged and distorted, late 4th century Roman gold filigree finger ring. 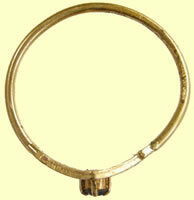 The hoop and shoulders are formed from beaded and twisted wires on a narrow backing plate. 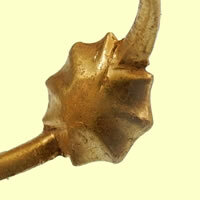 The shoulders are decorated with spirals with small gold globules at their centres and clusters between. 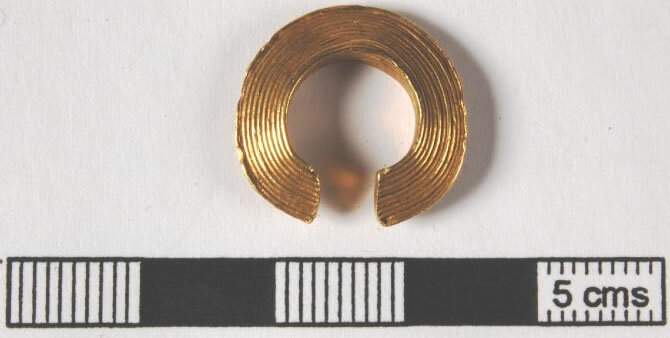 There are six spirals on one shoulder (in two vertical rows of three) and five on the other (in two vertical rows, one of three and the other of two, presumably missing the third spiral). 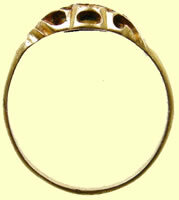 A collar in the form of a twisted rope design surrounds the round bezel setting. 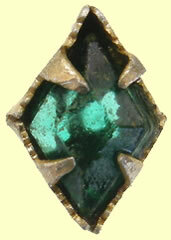 The bezel setting contains a round, domed green glass fitting, badly cracked. 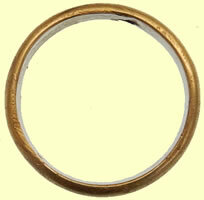 The ring has an internal diameter of 200mm by 4mm (distorted) and weighs 4.35g. 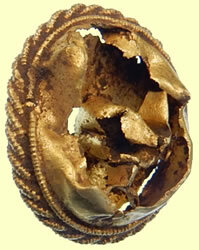 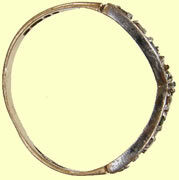 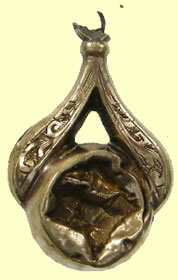 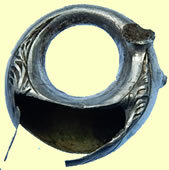 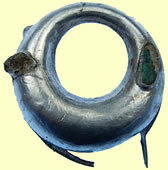 A similar example can be seen in Johns and Potter, 1983, The Thetford Treasure: Roman Jewelry and silver. 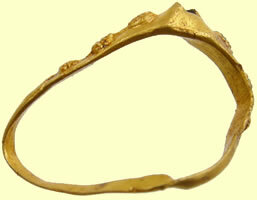 This object ws reported and declared treasure under the stipulations of the Treasure Act 1996. 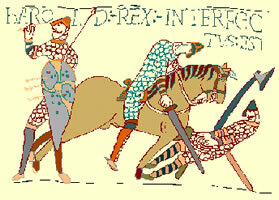 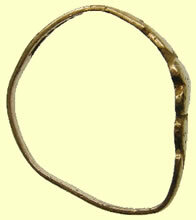 It was subsequently acquired by Colchester Museums. 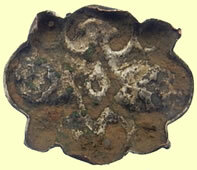 Enamelled roundel, with a gold backplate and a gold outer wall which is very perfectly and neatly soldered on, but at one point now torn and distorted. 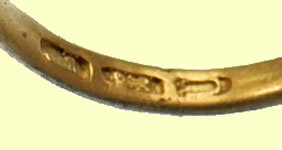 Extremely slender internal cell walls of gold pick out a human figure from the waist up, holding out the left arm and with a further curving wall perhaps depicting the right arm. 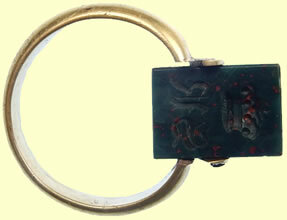 Both cells of the figure, head/body/left arm and right arm, are filled with dark green enamel, and there is white opaque enamel outside. 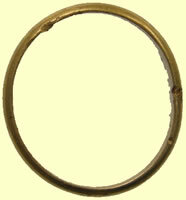 This roundel is about the right size to come from a finger-ring, and circular roundels of similar size are known from tenth-century gold finger-rings such as PAS-D681D8, LON-3478C7, and two noted in Treasure Annual Reports but not yet on the PAS database (TAR2003, no.110; 2003T 24 and TAR2001, no. 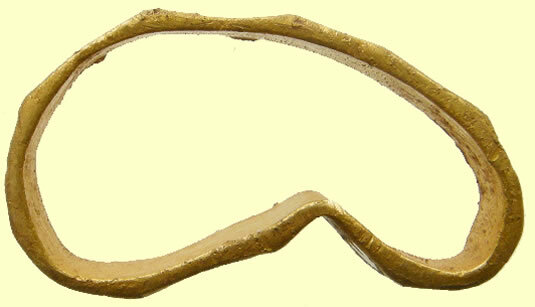 46; 2001T11). 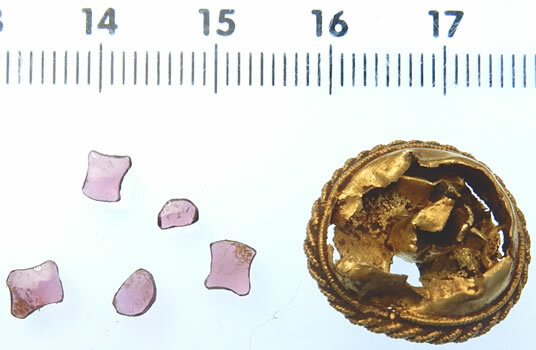 All of these depict a four-petalled flower, but different designs are found in base metals on LVPL500 (a four-cell pattern with alternating red T-cells and blue mushroom cells) and LON-A2FD02 (a rectangular field with two petal shapes). 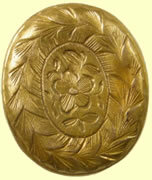 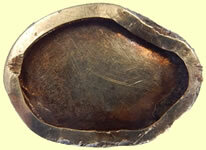 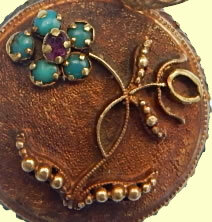 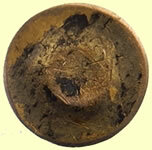 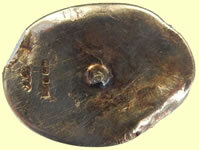 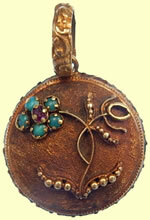 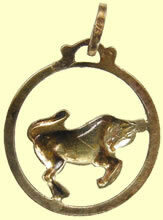 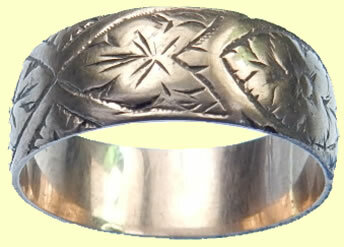 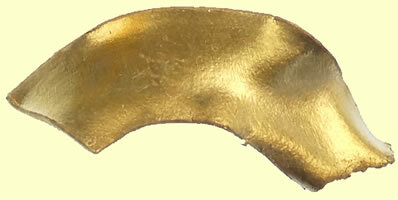 See DENO-5BCF87, however, for the four-petal enamelling on a copper-alloy ring. 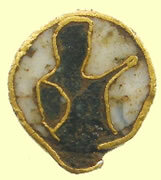 Another detached roundel of similar size, but with a design of the Hand of God, was reported as Treasure in 2006 (T242; TAR 2005/6, no. 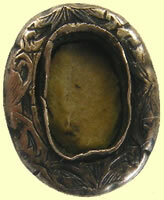 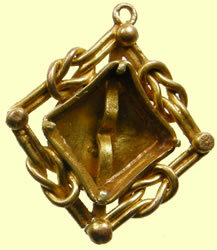 286), and interpreted as a setting from a larger religious object such as an altar cross, book cover or reliquary. 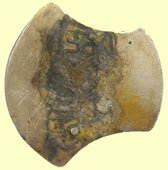 The opaque white and dark green enamels of ESS-9E6D71are easily paralleled among these finds, but the particular motif, with a hand raised in blessing, does not appear to have been noted before. 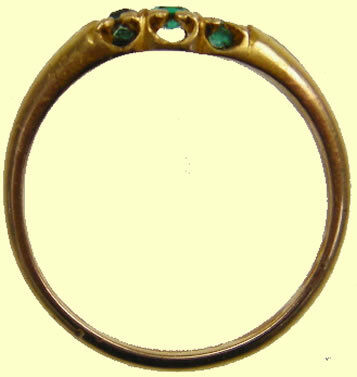 These enamel settings are well known from Continental workshops, but the number now known from the 9th to 11th centuries in England (including very high quality work such as the Alfred Jewel) shows that they are also likely to have been made here. 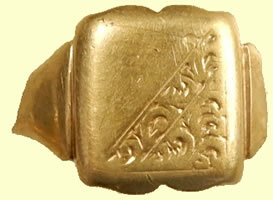 The object fulfils the Treasure Act (1996) in that it is more than 300 years old and has a precious metal content exceeding 10%. 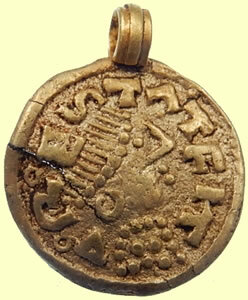 The coin is not Saxon but the rest of the pendant might be. 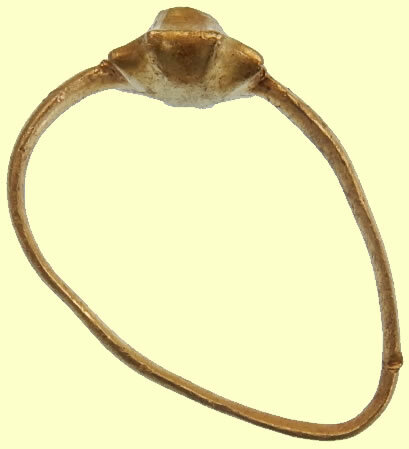 This is the Madelinus type from Dorestad in the Netherlands, which has been found in England in relatively large numbers. 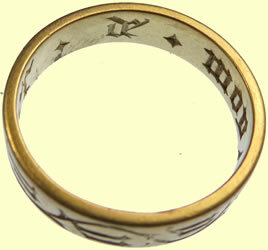 I shall record it as EMC 2015.0083. 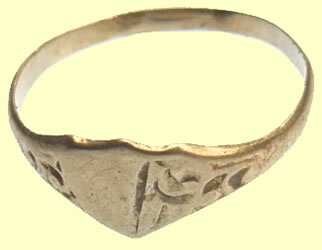 Treasure 2008 T580 Medieval finger ring. 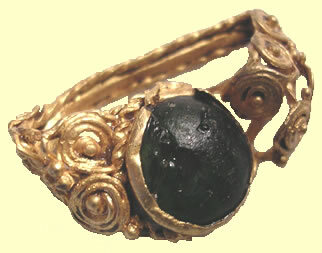 James Robinson, British Museum Report: A Medieval finger-ring with a simple wire hoop and a symmetrical hexagonal bezel set with a sapphire. 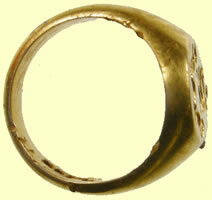 The finger-ring is gold, and dates from the late twelfth or the thirteenth century. 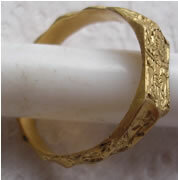 Consequently, in terms of age and as the object contains a minimum of 10% precious metal it qualifies as Treasure under the stipulations of the Treasure Act 1996. 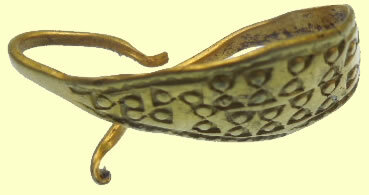 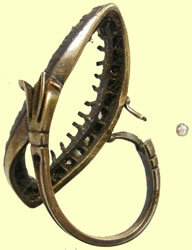 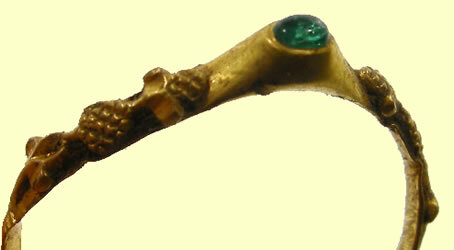 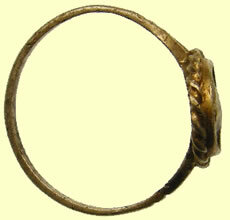 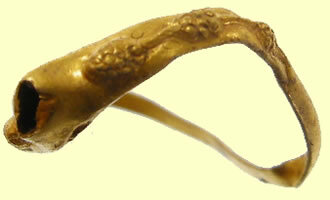 Medieval gold finger ring. 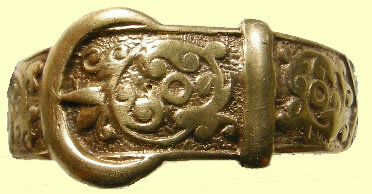 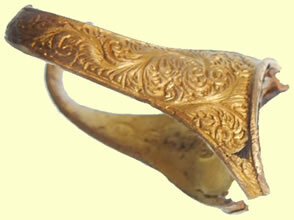 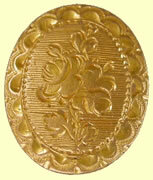 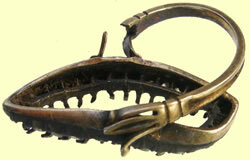 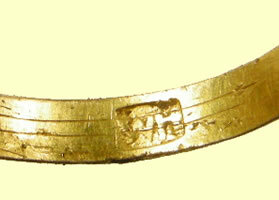 The band has engraved decoration in the form of three flowers on stems with inscriptions inbetween. 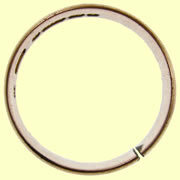 The internal band is plain and undecorated. 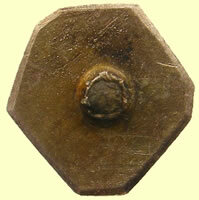 There is no makers mark or hall mark. 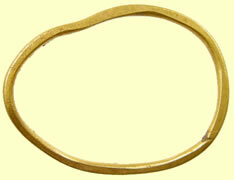 The band is wide, thick. 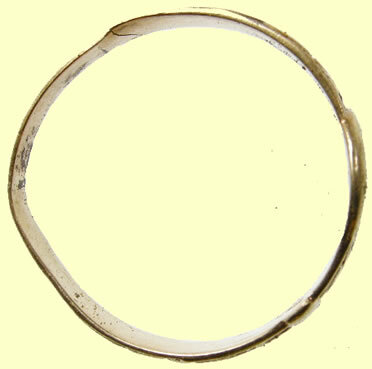 The band is damaged and the shape distorted; in its current condition the ring has an external measurements of 19.45mm by 12.14mm, and internal measurements of 18.19mm by 10.82mm. 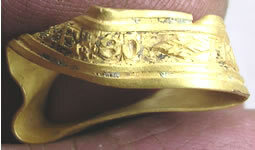 Complete gold finger ring. 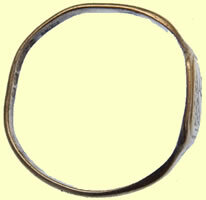 The ring takes the form of a simple band. The hoop of the ring is flat in section and is of equal width and thickness for its circumference. 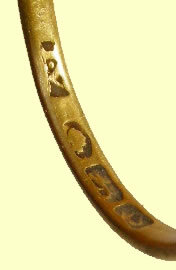 On the outer face of the hoop is an engraved inscription, now partial due to wear. 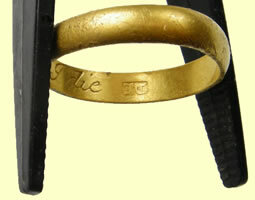 It reads +PVR [?] 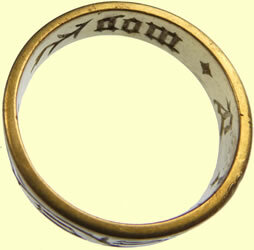 VOSTR[E].........[S]ENS SV??[ST].......?? 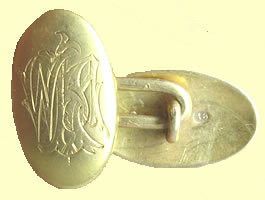 [MARIA monogram ?] 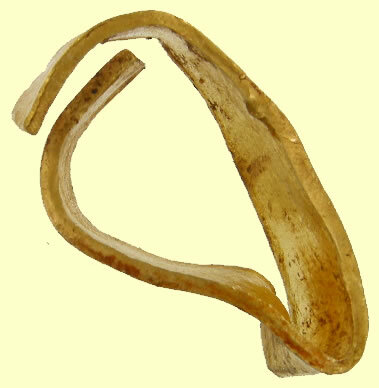 There are no traces of enamel. 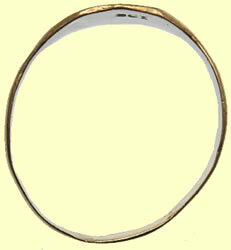 The hoop is now distorted. 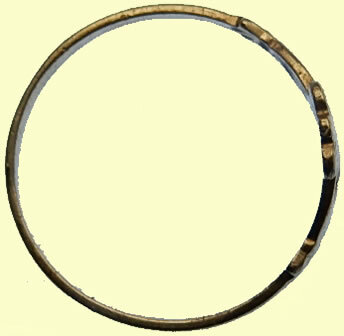 The external diameter of the hoop is 24.26mm lengthways and 2.65mm across the narrower diameter. 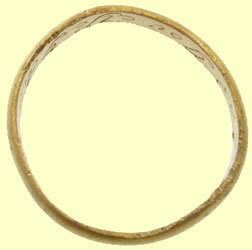 The hoop is 2.42mm wide and 0.74mm thick. 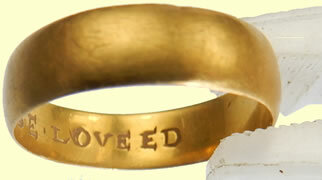 It weighs 1.18g. 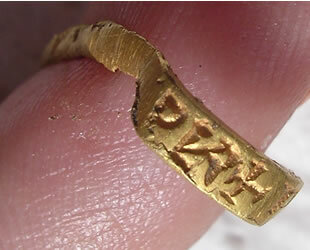 Then inscription is so worn that it is impossible to decipher. 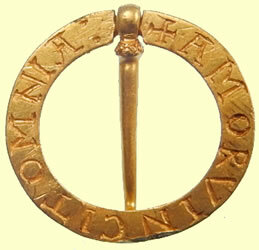 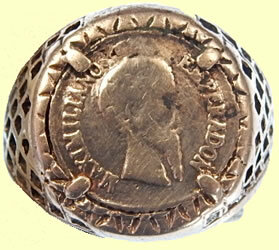 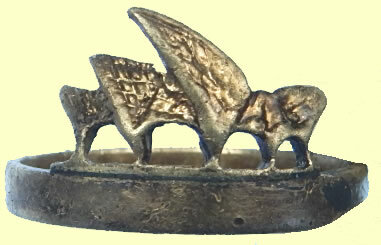 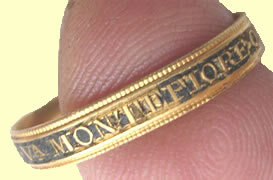 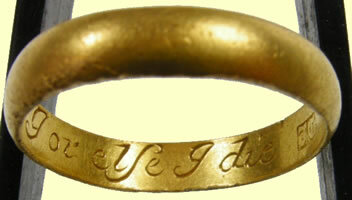 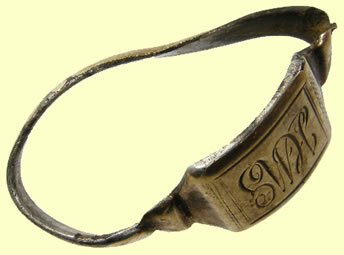 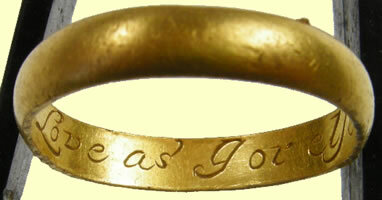 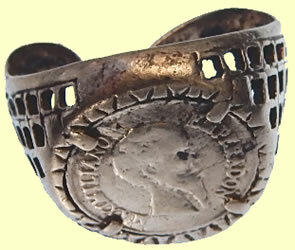 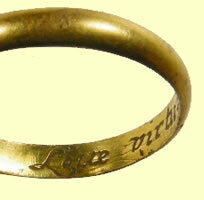 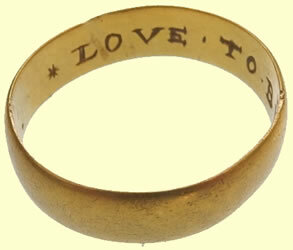 There are no similar inscriptions on rings in the British Museum. 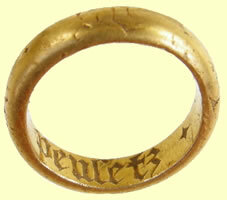 However, the form of the lettering and the initial cross can be paralleled in inscriptions on rings of serjeants-at-law of the 16th to early 17th century. 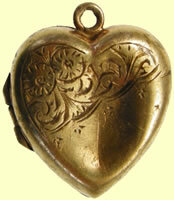 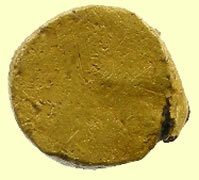 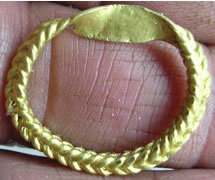 The object contains a minimum of 10% gold and is over 300 years old. 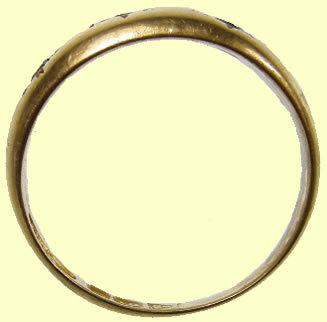 Consequently it qualifies as Treasure under the stipulations of the Treasure Act 1996 in terms of both age and precious metal content. 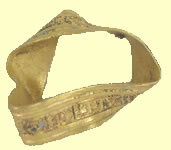 The artefact has been disclaimed as treasure. 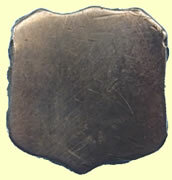 Cannot clean off the black tar substance sticking to it as it has to be handed in uncleaned as a treasure item. 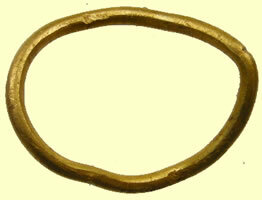 Complete gold ring. 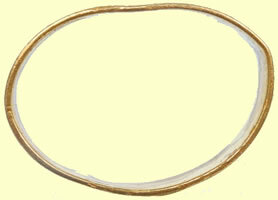 The hoop has a D shaped section. 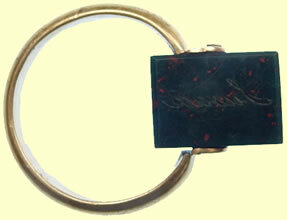 The exterior is engraved with cross hatching within borders, extending around the entirety of the hoop. 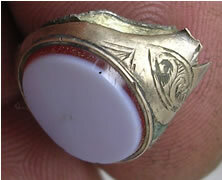 The border and cross-hatching retain some black enamel within the engraving. 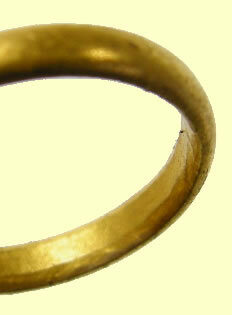 The interior of the loop is stamped with a hallmark that appears to have been deliberately obliterated. 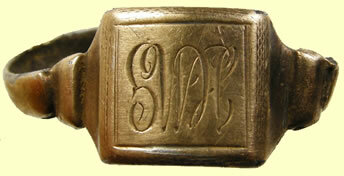 A maker's mark ‘II’ is visible. The ring has an external diameter of 18.94mm. 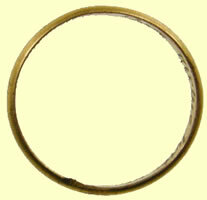 The width of hoop is 3.86mm and the object weighs 2.73g. 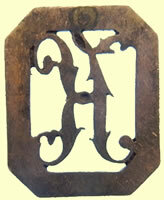 It dates from the second half of the 17th century to the first quarter of the 18th century. 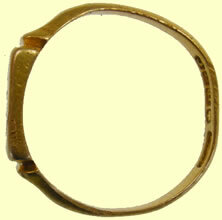 This object was reported under the stipulations of the Treasure Act 1996. It was subsequently disclaimed and returned to the finder. 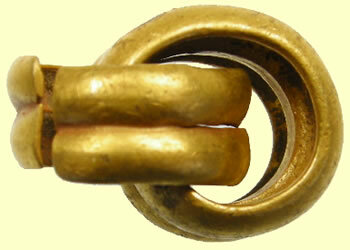 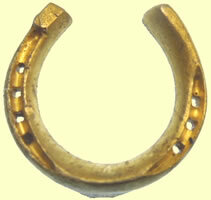 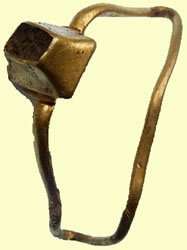 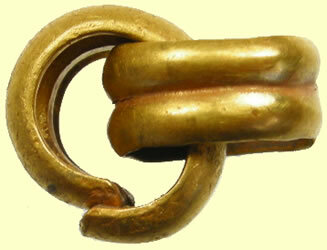 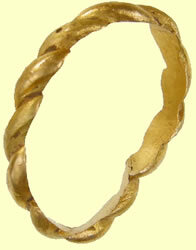 Complete gold post-medieval finger ring. The hoop is formed from a thin band that is semicircular in section, having a flat inner face. 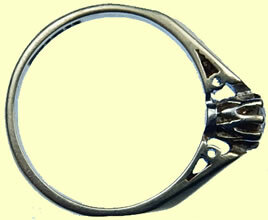 The exterior of the hoop is engraved with a skull flanked by pointed triangular panels with traces of white enamel in a lozenge pattern. 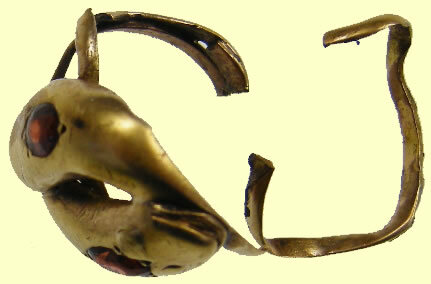 The skull may once have been enamelled black. 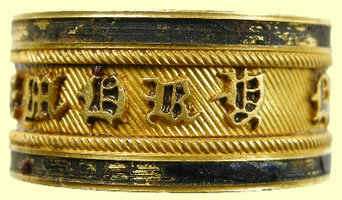 The interior of the ring is inscribed Prepared be to follow me IK ob 4 1st 67’ (IK having died 4th January 1667), containing much of its original black enamelling. 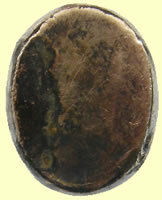 The inscription is followed by the maker’s mark BW in a rectangular shield. 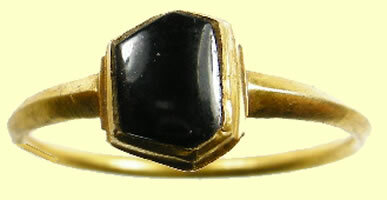 This is a characteristic type of mourning ring. 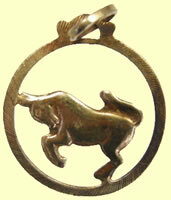 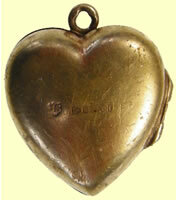 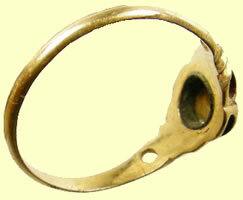 There are thirteen similar examples in the British Museum dating from the 1660’s to the 1730’s (Dalton ring cat. 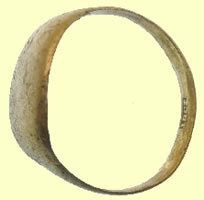 1912, numbers 1462-1474). 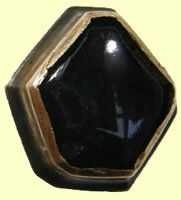 Dalton illustrates similar black enamelled skulls (1471-1472) and similar triangular panels (1474). 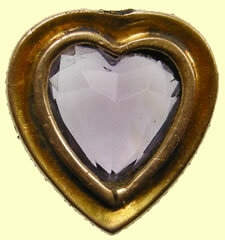 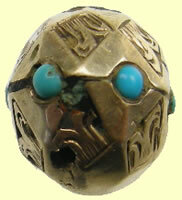 This item was reported and declared treasure under the stipulations of the Treasure Act 1996. 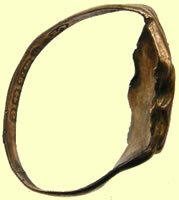 It was subsequently purchased by Colchester Museums. 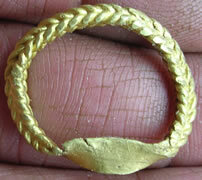 Circumstances of discovery: Whilst searching with a metal detector. 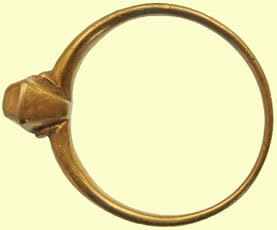 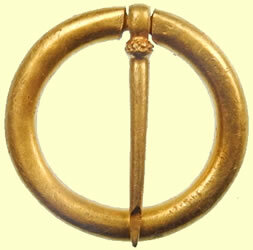 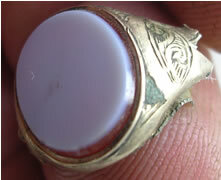 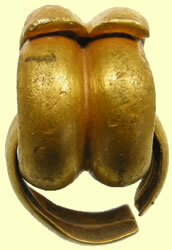 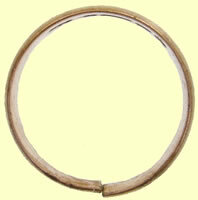 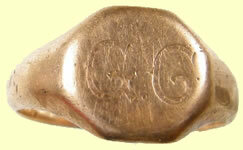 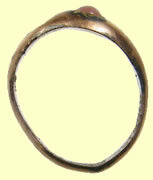 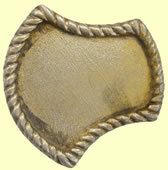 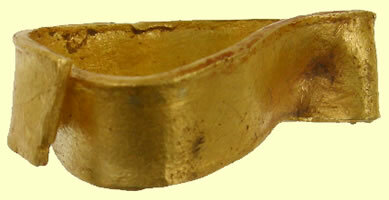 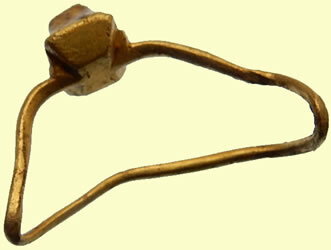 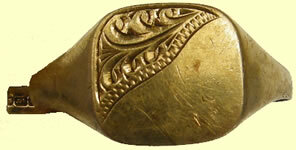 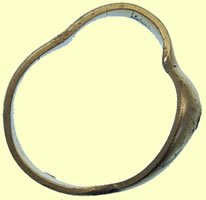 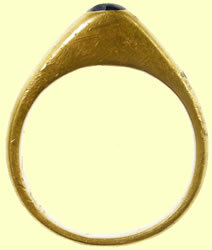 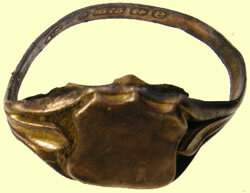 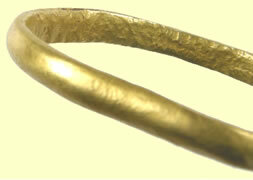 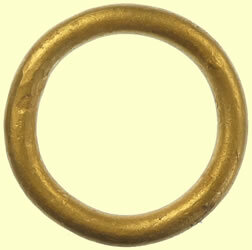 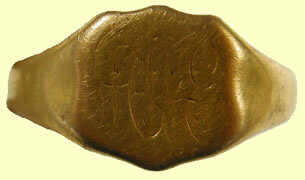 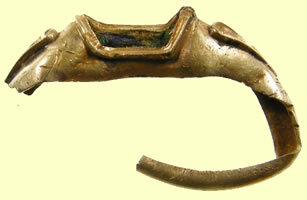 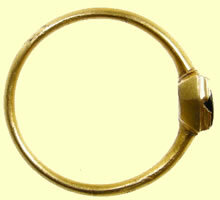 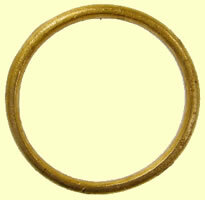 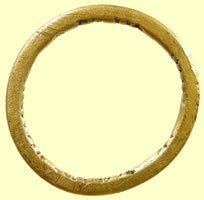 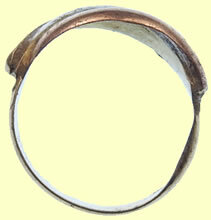 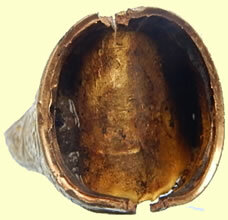 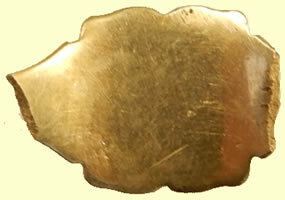 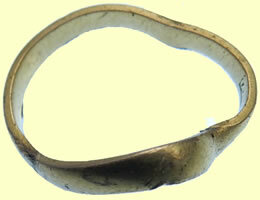 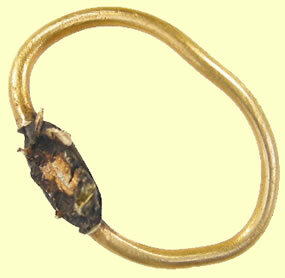 Description: Cast gold finger ring with a groove around its circumference to give the impression of two bands. 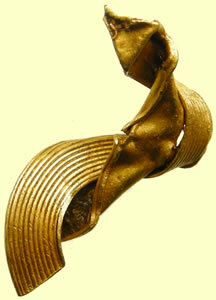 Each of the 'bands' is decorated with eight cast spirals, with each spiral separated by oblique lines. 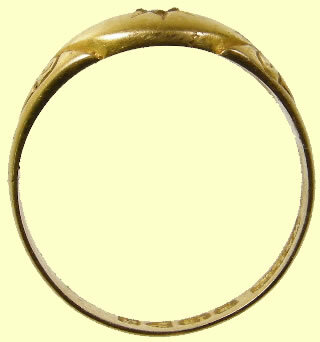 The recesses of the spirals contain traces of black enamel while the recesses of the oblique lines contain traces of white enamel. 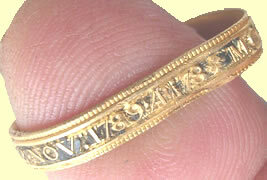 In its current condition, it measures The inside of the hoop is inscribed over two lines: LET TRVTHE ADVANCE / ECHE FORTVNES CHAVNG (the last word was probably intended to be CHANCE). 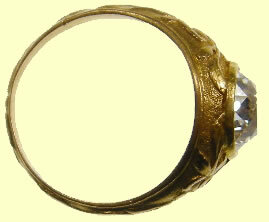 The ring is complete, but distorted. 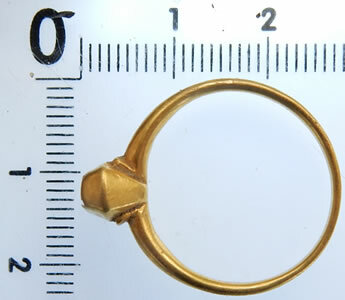 In its current condition it measures 25.93mm by 6.82mm. 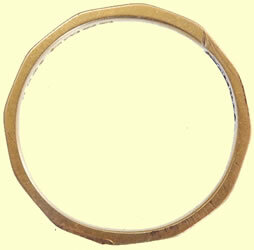 The band is 8.09mm wide and 1.97mm thick. 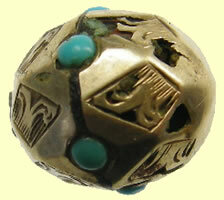 It weighs 5.78 grams. 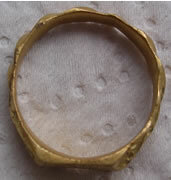 Description: Tiny gold ring, very thin plain hoop, stamped inside with maker's mark I.S with pellet between in oblong shield and what may be a date letter. 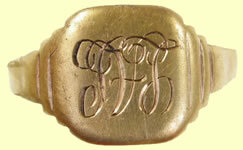 Discussion: The earliest possible mark that resembles this I.S mark in Grimwade is no. 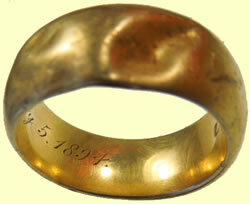 1654 for John Spencer, entered 1739. 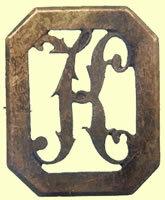 Other similar marks are all late 18th Century. 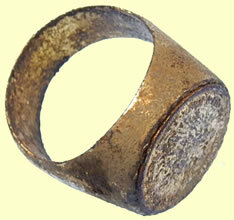 This suggests that this ring is not more than 300 years old. 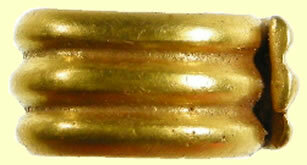 References: Grimwade, A. 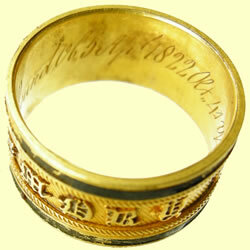 1976, London goldsmiths 1697-1837: their marks and lives from the original registers at Goldsmiths' Hall and other sources, London. 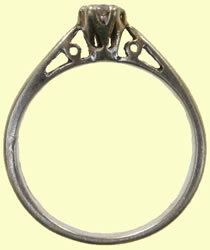 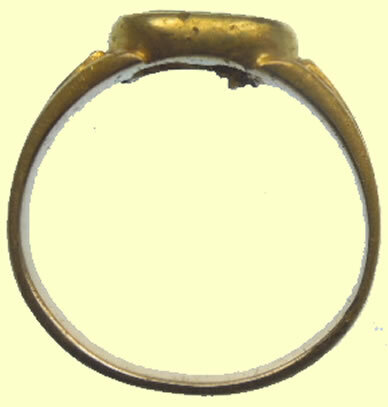 The ring is Post-Medieval but very hard to date due to its simple form, but it is possibly late 18th or early 19th Century. 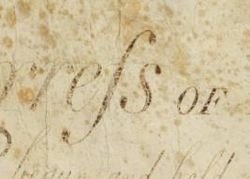 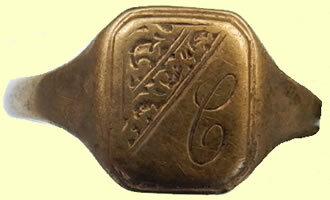 The find dates to later than 1709 and as such falls outside the provisions of the Treasure Act 1996. 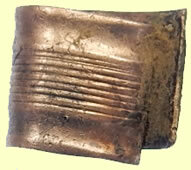 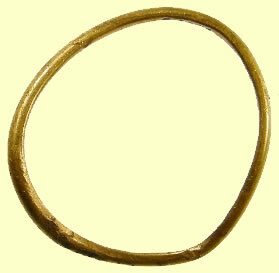 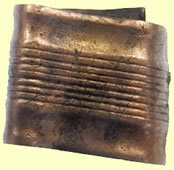 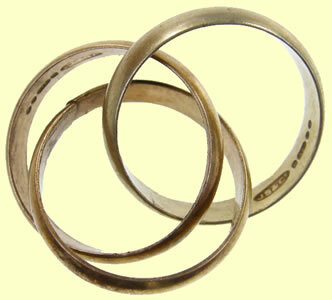 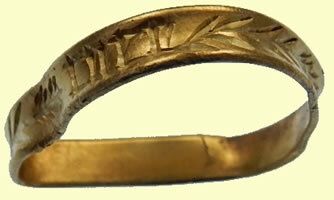 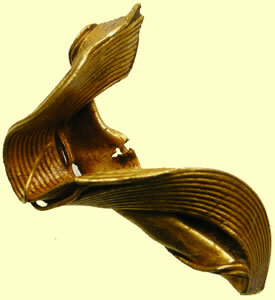 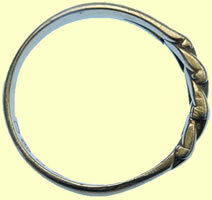 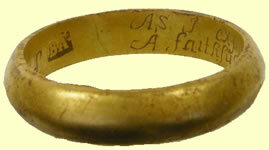 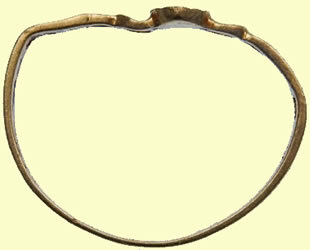 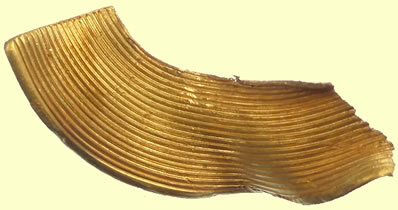 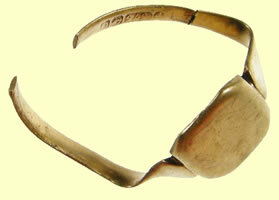 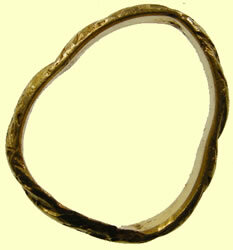 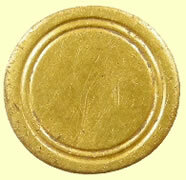 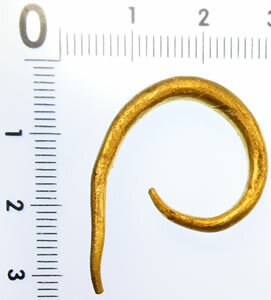 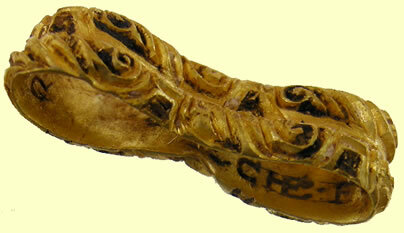 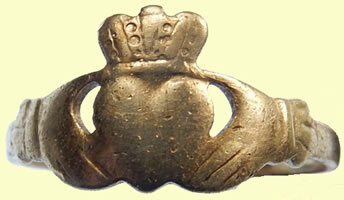 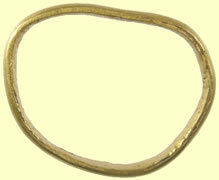 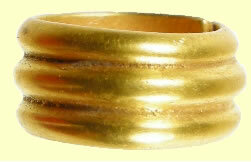 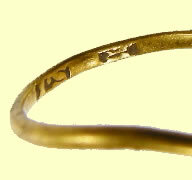 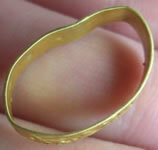 Description: Misshapen small plain gold band. 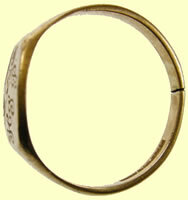 There is no inner inscription or makers mark on the ring, therefore it is not possible to accurately date this finger-ring. 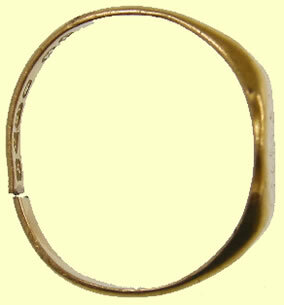 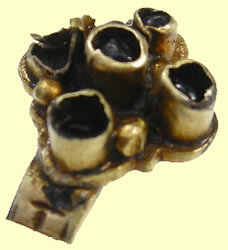 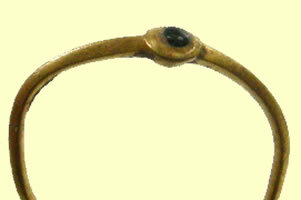 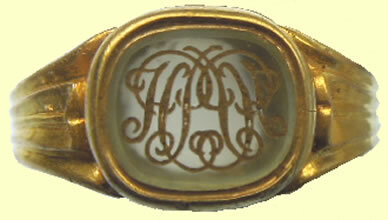 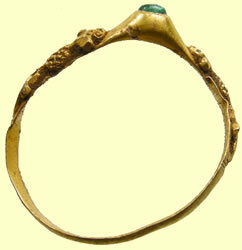 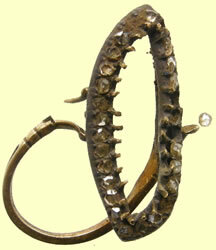 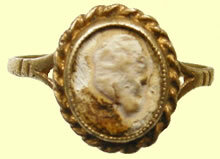 Modern (early 19th century) gold finger ring with lozengeform bezel containing four circular recesses for missing stones. 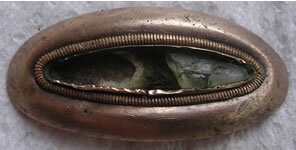 The underneath of the bezel is hollow. 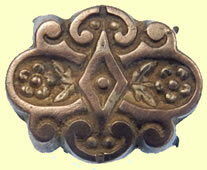 The shoulders have an openwork design shaped like a 'comma'. 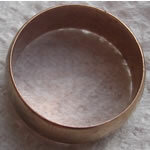 It is 18.46mm in diameter, the band is 2.11mm wide, 0.90mm thick, the bezel measures 11.18mm by 8.15mm and is 2.85mm thick. 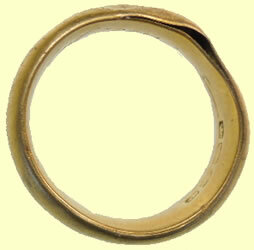 There are no hall marks on the ring. 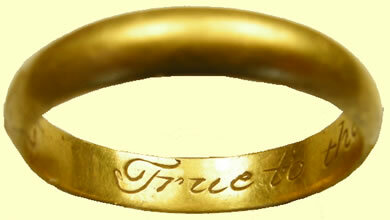 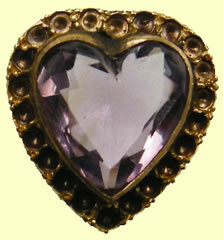 Due to the date of the ring (19th century) it does not qualify as Treasure under the Treasure Act (1996). 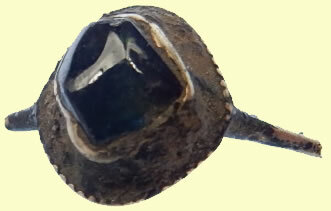 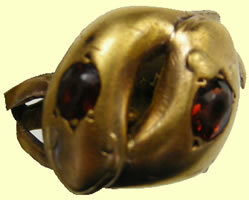 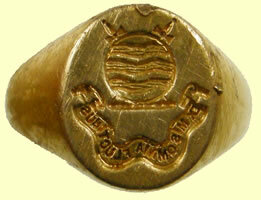 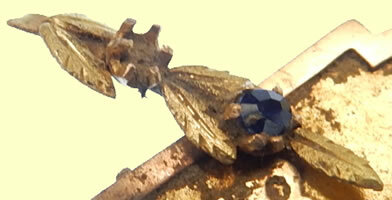 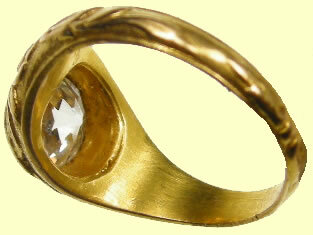 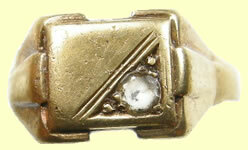 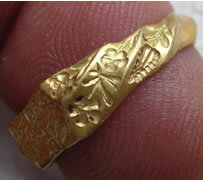 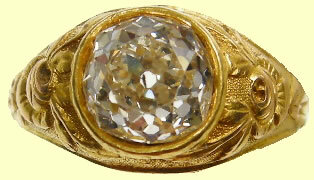 Fascinating gold ring - no hall marks so could be early - 26 diamond/stones and 25 remain - one is loose as in the picture. 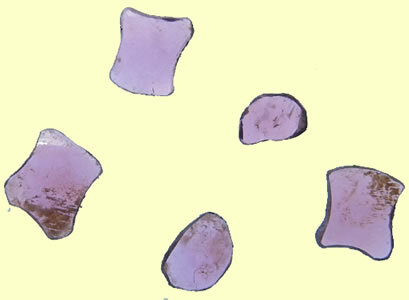 They look like rough cut diamonds and all are different shapes. 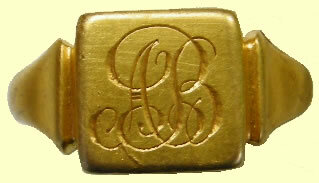 Solid gold cuff links, 18 carat with a makers mark TC. 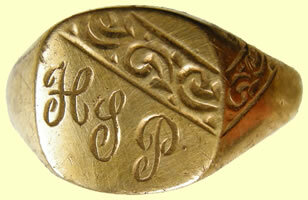 They are probably 19thC by the engraved lettering style WLA, they appear to have have a foreign mark which requires more research. 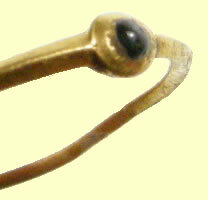 Modern gold finger ring. 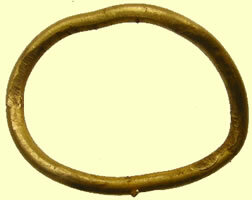 British Museum Report: Gold finger ring made of three strands of twisted metal, which are flattened at the bezel to create a thin sheet. 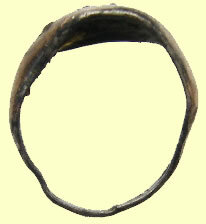 The hoop is slightly out of shape; the bezel has twisted and has cracks within it. 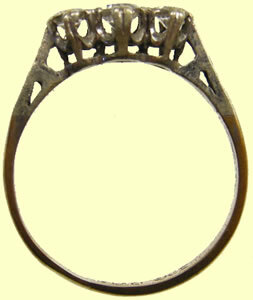 Modern gold finger ring, with openwork lozenge bezel set with a small stone. 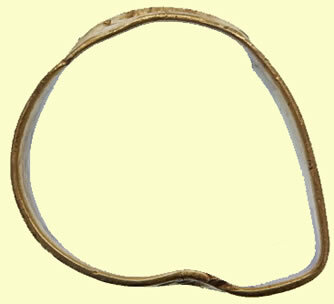 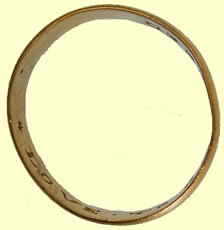 The circular band is plain and undecorated. 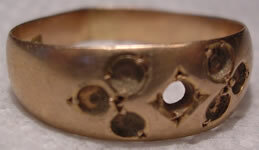 The inside of the band has the hallmark 750 in lozenge / (five pointed star)18 AR in rectangle / CD in oval Both the 750 and 18 relate to the purity, which in this case is 18 carat gold. 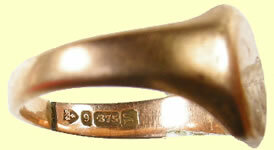 As the 750 is not accompanied by a crown, it makes the hallmark continental rather than British. 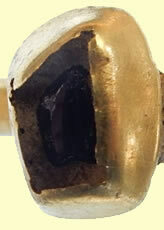 No exact match for the hallmark could be found; the star is used by several countries on the continent, including Norway and Spain. 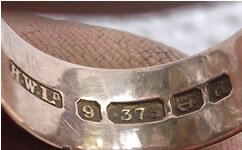 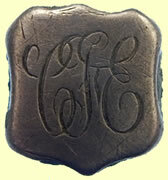 The AR and CD could represent the assay office, or makers / sponsors marks. 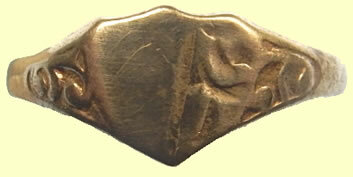 AR could possibly be Aragon. 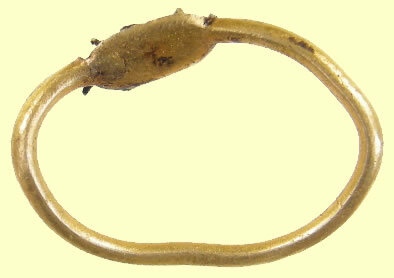 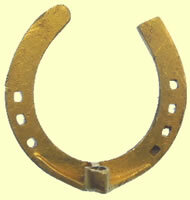 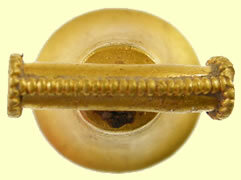 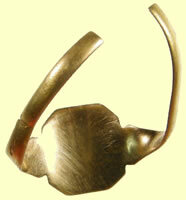 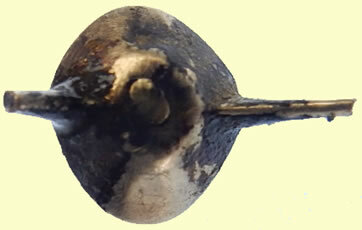 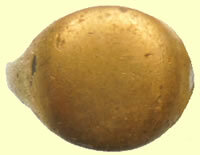 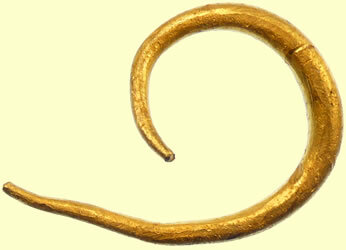 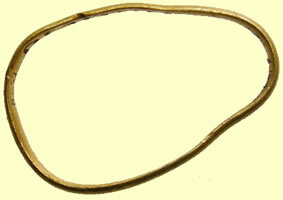 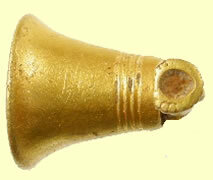 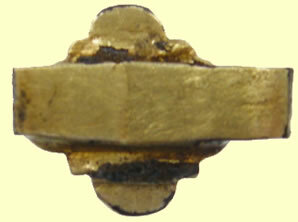 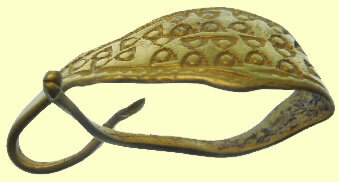 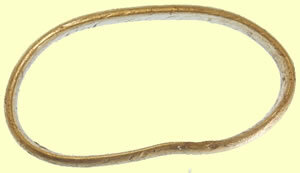 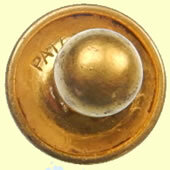 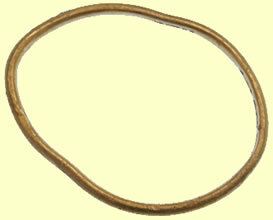 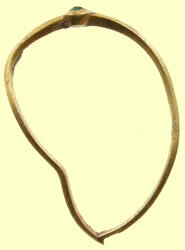 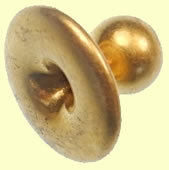 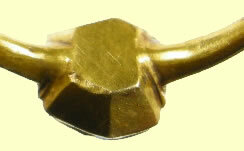 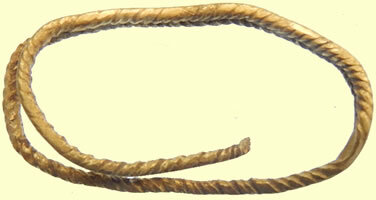 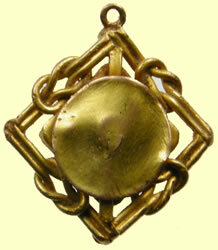 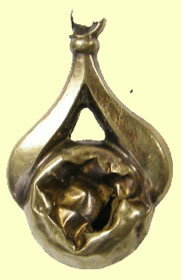 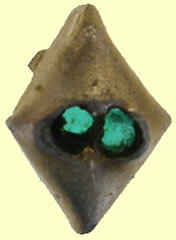 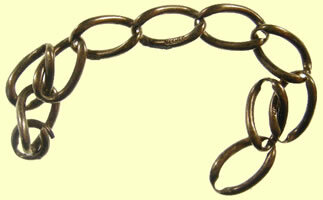 Gold bell-shaped pendant with hollow tube for attachement. 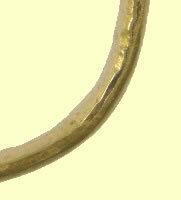 The tube is 11.46mm long, 2.37mmin diameter, with cast beading along its apex and terminals - the diameter increases to 3.33 at the terminals. 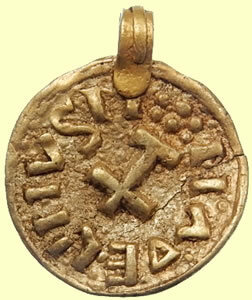 The pendant is sub-triangular in plan with a circular cross section, measuring 9.2mm long, 5.14mm in diameter at the apex and 10.3mm by 10.75mm at the base. 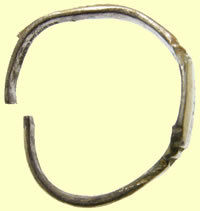 There are four grooves around the circumference towards the attachment end. 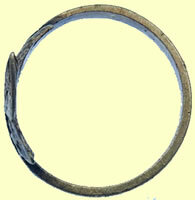 The circular base has two incised concentric rings. 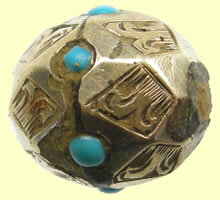 It weighs 2.62 grams. 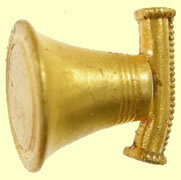 British Museum Report: Description: A small gold pendant in the form of a bell. 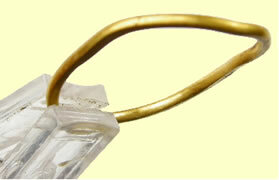 A tubular fitting along the top for suspension is decorated with filigree wire. 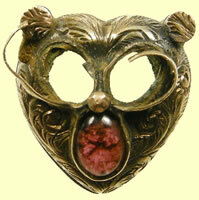 The decoration appears to be engine-turned. 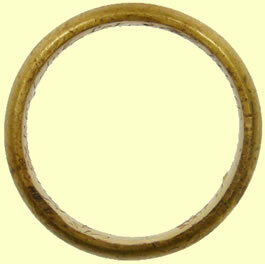 With no comparable material, it is not securely dateable pre-1708. 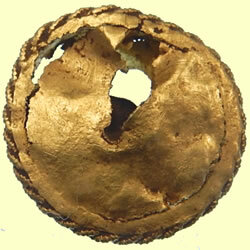 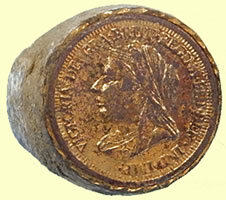 The find can not be securely dated to pre-1708 and as such falls outside the provisions of the Treasure Act 1996.